The dog has become an invaluable tool for the funeral home in helping local families deal with their grief. Some people even ask to bring the dogs with them to the cemetery, providing them with some comfort while they visit the burial site of a loved one. "Our experience has shown that people can let go totally when they interact with a dog. The dogs are just there, to pet, to hug and to cry on," said Ursula Kempe, president of Therapy Dogs International. "Their calming, loving presence can help during times of extreme grief. There is no need to talk, just to feel. The dogs can give what humans cannot." 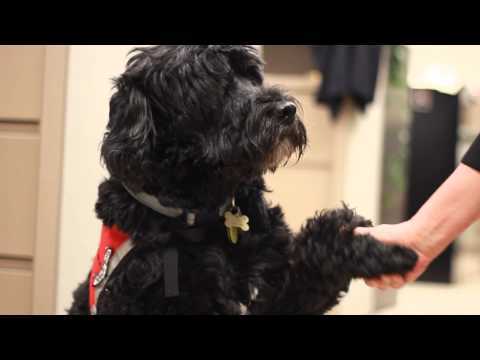 While therapy dogs have become common in hospitals, mental health facilities and schools, G.H. Herrmann is unique in using certified therapy dogs in its funeral homes. Herrmann came up with the idea about using therapy dogs in his funeral homes after a discussion with a long-time friend. Kevin Knartzer, director of training and canine development at Bargersville Veterinary Hospital, trains service dogs for the disabled. One afternoon, Knartzer stopped by the funeral home to see Herrmann. He had brought Lady, a golden retriever he was training. A family was planning the funeral of their father and grandfather who had died. But once the dog stepped into the room, the small children stopped crying and focused their attention on Lady. "They're planning for their grandfather's funeral, and they're crying. Then all of a sudden they see a dog, and they smile, their eyes light up and they felt better," Herrmann said. He and Knartzer immediately seized on the potential good that a therapy dog could provide. "It lifts people's spirits. Dogs give people a chance to take a break from their biggest worry and really have a moment to think of something else," Knartzer said. "People almost transfer their feelings to the dog. It gives them that respite for a moment." The program at G.H. Herrmann started tentatively. Herrmann was concerned that while some people might enjoy having a dog present while they planned a funeral, others would complain. But after three years, he has yet to hear anything negative about the program. G.H. Herrmann now features four dogs, which split time between the three Herrmann locations. Each dog has a handler who takes him or her home at night, feeds them and cares for them. All of them work for the funeral home. Each of the dogs has become a celebrity inside the funeral homes. Funeral director April Williams has seen how people have latched onto the dogs, coming back months and even years after a funeral to see the dog that comforted them. Thanks for the sharing.You made some good points .I did a little research on the topic and found that most people agree with your blog. Thanks.